Building Link Wheels is one of the most modern and powerful techniques at your disposal in your quest for more traffic, more links and more link juice. Take up the VodaHits Link Wheel building service to make sure you’re really grabbing the Googlebot’s attention. The link wheels that we will create for your website are simply comprised by a group of relevant, high-PageRank websites that are inter-connected. Each website links to the next (as well as back to your website) until the last website in the series, which links back to the first and thus creates the link “wheel”. The Link Wheel concept has become legendary; a buzz word that is readily discussed by many SEO gurus today. Building Link Wheels is a fantastic strategy because not only does it builds links in a natural way but it also harnesses the power of multiplication and greatly increases the value of each of the Link Wheel backlinks you have created. The Link Wheel is such a powerful link building concept simply for the fact that because it aims to simulate the natural link building pattern that the search engines love to see so much and because it multiplies the link juice that your website receives many-fold. Rather than getting links from unrelated websites and dubious sources, VodaHits’ Link Wheel strategy builds your links from related Internet niches and Link Wheels have the ability to multiply your links count over a period of time. The Link Wheel is an essential and indispensable addition to your link building campaign. VodaHits will add your Link Wheel URLs to our RSS Blast service and will ping all the URLs of your Link Wheel pages across 100 ping sites indefinitely until they have been 100% crawled by Google’s Googlebot! 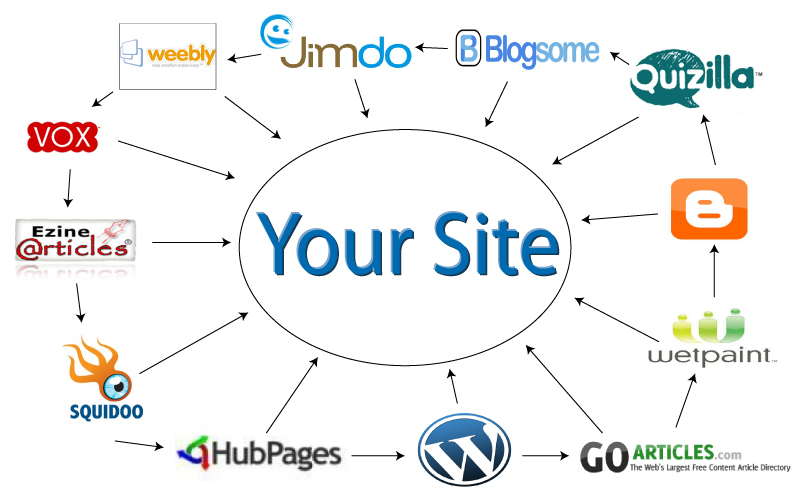 We make use of only well established websites in creating your Link Wheels. We submit only to websites and Web 2.0 platforms with PR4 to PR9. There will be original content, which will be submitted to article sites, blogs, press releases and web 2.0 sites. We ensure that the websites that we use have the “DoFollow” attribute. You can choose to promote your home page as well as inner pages. In general you will see an increase in your rankings within anywhere between one week to one month based on the existing competition level for your keywords. Is it safe to make use of VodaHits Link Wheel services? You can confidently make use of our link wheel services! Our Link Wheels are not only the most effective Link Wheel strategy but it is also one of the safest approaches to link building. Are the links you build natural? Yes, all the links we build are 100% natural. We ensure that all the sites are hosted in different C-class servers and in addition, we make use of random linking to imitate a natural link building pattern. Will the content you create be unique? We have professional SEO writers who will create original content for your website. Is it possible to get link wheel services with other VodaHits SEO packages? It is absolutely possible. By combining our Link Wheel services with the other SEO packages from VodaHits, you can produce phenomenal results. How frequently do I have to use VodaHits-Link Wheel services? It will be sufficient to make use of VodaHits’ Link Wheel service once a month and regular usage will help you improve the quality of the link each month. Am I allowed to target inner pages of my website? Yes, it’s totally up to you to choose the target URL.